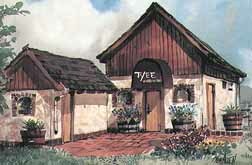 Tyee Wine Cellars is located on a 460-acre, 4th generation family farm near the Coast Range soouth of Corvallis, the heart of Oregon's Willamette Valley. Tyee to the Northwest native meant, "chief" and "best." They specialize in limited production of fine handcrasfted varietal wines including Pinot noir, Pinot gris, Chardonnay, Dry Gewurztraminer, and Pinot blanc. Taste Tyee wines, then picnic and hike the 1 1/2 mile Beaver Pond Loop Trail on the historic farm near scenic Mary's Peak. Ask for their newsletter about Tyee traditions, celebrations, and new releases. Private gatherings by reservation. VISITORS WELCOME.